Home Blog Invest In Equity Like A Hare Or A Tortoise? You must have heard this story when you were young “The Hare and the Tortoise”. The hare is much faster than the tortoise. In the end it is the tortoise which wins the race. In the World of Investing there is a slight twist in the tale. 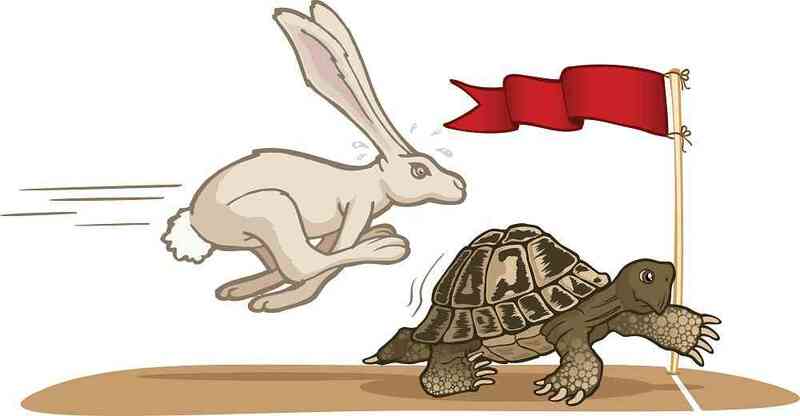 Both the Hare and the Tortoise have an equal chance of winning. It doesn’t matter if you are the hare or the tortoise. Winning is entirely in your hands. In the story of the hare and the tortoise, both of them decided where the finish line would be. If the finish line was too close, the hare would finish the race in no time. This would be unfair to the tortoise. The finish line was long enough, that the hare could complete most of it in no time and still have enough confidence that it could beat the tortoise even after a nap. This gave a chance for the tortoise to win the race. You set financial goals which you want to achieve. These goals may be short term, medium term or long term. Short term: Collect money to go on a holiday abroad after a year. Medium term: Collect money to buy a car. Long term: Collect money for retirement. Setting your financial goals is similar to the hare and the tortoise deciding the finish line. However when it comes to investing there is a difference in the story. You set different finishing lines based on the time it takes to achieve your financial goals. Short term financial goals may be set for a year. Medium term financial goals may be set between 1 to 3 years. Long term financial goals can be set for 10 to 30 years or more. Remember: In investing it doesn’t matter if you are the hare or the tortoise. Winning is important. Are you a hare or tortoise while investing in equity? You are investing for a short term financial goal. You want to go on a foreign holiday after a year. If you are a hare, you would invest in equity (Equity mutual funds and stocks) for a very short time. You take a higher risk for a higher return. You are a hare in your investments. You want returns fast. You are most likely to achieve short term financial goals like collecting money to travel abroad, if you are a hare while investing. However you must be patient and disciplined while investing. Do not take a nap close to the finish line. You are investing for a long term financial goal like collecting money for retirement. If you are a tortoise you would invest in equity (Equity mutual funds and stocks) for a very long time. You take less risk by investing for the long term. You could stay invested for as long as 10 years or more. Over the long term equity is very safe. There is little chance of a loss. You are most likely to achieve long term financial goals like collecting money for retirement, if you are a tortoise while investing. An investor who invests like a hare does not have the patience to stay invested in equity for a long time. An investor who invests like a tortoise is very patient, stays invested for the long term and wins this race.